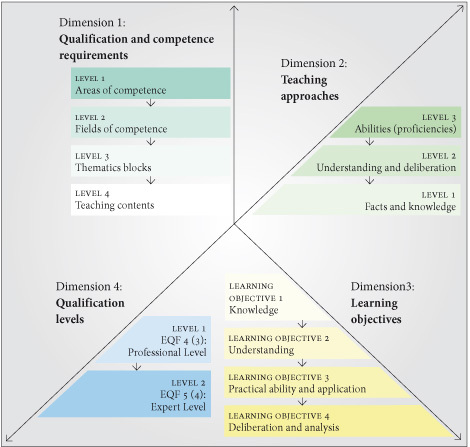 The Competence Framework comprises four descriptive dimensions and its taxonomy categorizes competence requirements over a total of four hierarchical levels. 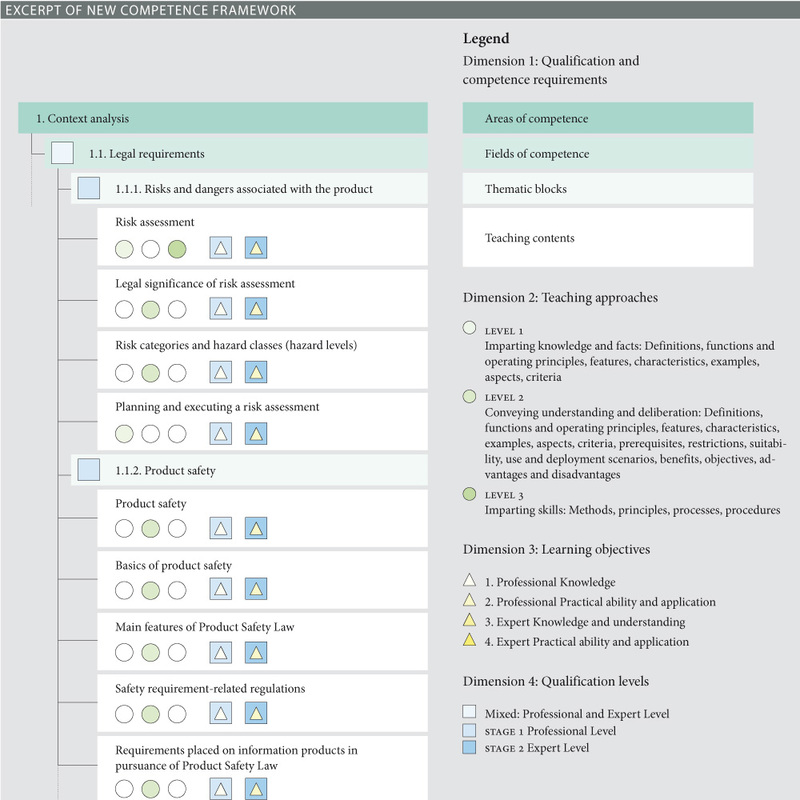 The four hierarchical levels of tekom’s Competence Framework classify the various qualification and competence requirements using a taxonomic method. Fields of competence A number of fields of competence for each area of competence, each given a title and a general description. 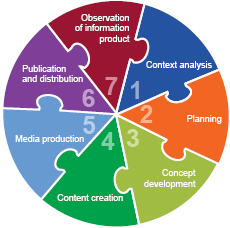 A total of 27 fields of competence describe the professional and workplace requirements for developing information products. Thematic blocks Each field of competence is underpinned by a number of thematic blocks. The various thematic blocks classify the individual teaching contents. Teaching contents A number of teaching contents for each thematic block. Teaching contents are the Competence Framework’s lowest level of detail. Approaches to teaching and imparting knowledge for teaching and qualification measures and the learning objectives for persons seeking to obtain qualifications are directly derived from these teaching contents. 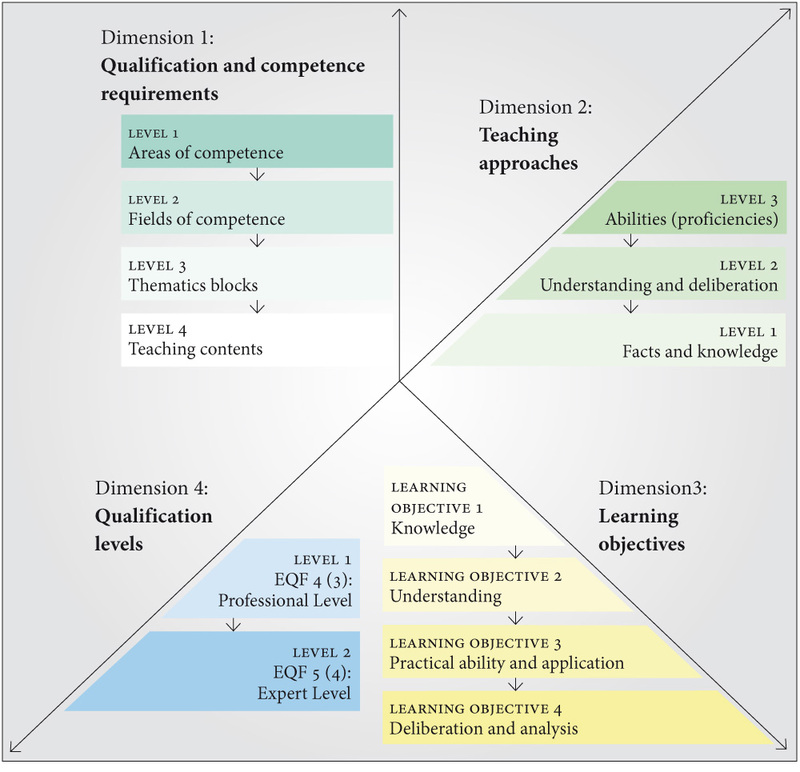 These four dimensions encompass the qualification space in technical communication focusing on qualification and competence requirements, teaching approaches, learning objectives and qualification levels. Deliberation and analysis: Invitation to break down the facts of an issue or of statements, data, problems etc. ; determining comparison criteria; critical juxtaposition and comparison; analysis of problems etc. ; own suggestions regarding setting of questions, examination options etc., analyzing, synthesizing, evaluating and developing means: Investigating, dissecting or compiling and combining facts, opinions, judgments and assessments in terms of their validity or quality or based on criteria. The relationships between the dimensions are especially important when applying the Competence Framework in a further education setting. The aim is to mesh the individual dimensions of the Competence Framework together during the further education and qualification process. 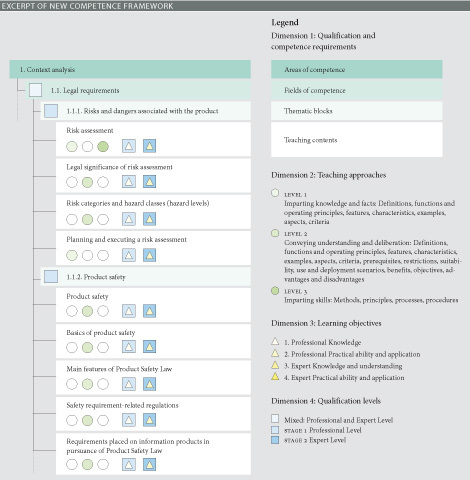 The following graphic illustrates these relationships: The competence requirements define teaching contents that are defined in the tekom Competence Framework. The competence requirements or teaching contents that result from them, are thematized using a specific teaching approach. This is done by further education institutes. The purpose of imparting knowledge is for the further education student to acquire knowledge and to achieve specific learning objectives. The end of the knowledge acquisition process must result in a specific learning outcome. Whether or not this has been achieved is ascertained during the certification exam by examination questions. If the learning outcome and examination results correspond to the defined qualification levels and skills profiles, the qualification of the further education student can be confirmed and endorsed by certification.